Indian hunters and French traders were the first explorers to find and pass through Traverse City. Due to the long crossing that they had to make by canoe over Grand Traverse Bay, they decided to name the region La Grand Traverse. However it was not until the early 18th century that the Ottawa and Chippewa people arrived and settled in the region. Responding to this major history event, Traverse City built the Eyaawing Museum & Cultural Center where individuals can learn more about the earliest arrivals in Traverse City. Rev. Peter Dougherty and his followers were the first people in 1839 to permanently settle and build a village at the tip of the Old Mission peninsula. The community grew slowly with it being accessible only by water, but as soon as the first road through the region was built in 1864, population grew rapidly. Just three miles north stands the Old Mission Lighthouse, which was built in 1870 to warn incoming ships about the rocky shoals of Old Mission Point. Knowing its importance to the city, the village of Old Mission was taken care of by the city’s people throughout the years, making sure that many of the original structures stayed standing and active. 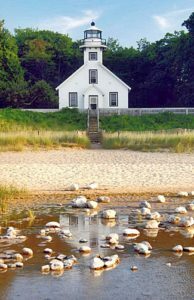 Along with the Old Mission Lighthouse, millworkers and woodcarvers built many roads, buildings, and cottages in the years after. 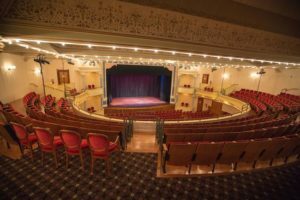 In 1891 the City Opera House was one of the many special landmarks built on Front Street, Traverse City’s main street. After the lumber boom ended, the economy switched to manufacturing and agriculture – growing potatoes, apples, and eventually cherries. 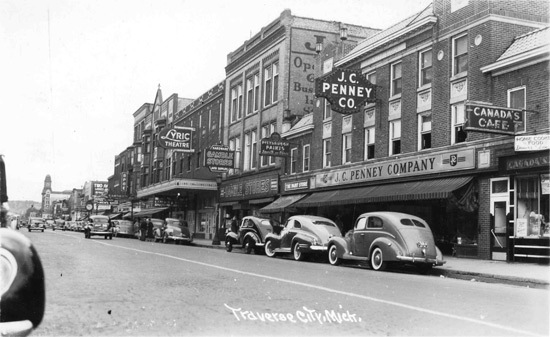 The continual development of shops, restaurants, and attractions has made Traverse City a favorite place to live in and travel to in the years leading up to today.